April is when the most beautiful greens appear to be photographed up on the rolling hills. We’ll also explore medieval towns and villages where you can capture historical architecture and daily life. We’ll take you to Siena perched high on a hill, with Etruscan origins, to photograph in the historic centre of the city with the famous clam-shell shaped Piazza del Campo. 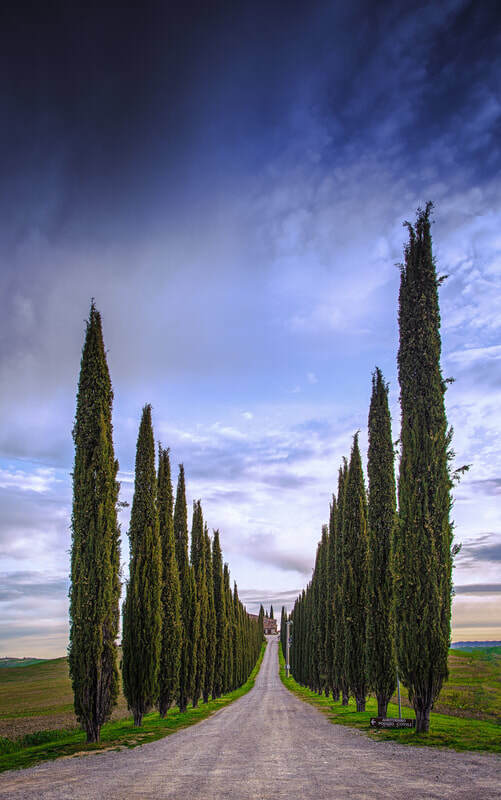 We’ll visit the charming 15th Century town of Pienza with Renaissance architecture. Montalcino looks like a classic fairy tale village that begs to be photographed with fortified walls and surrounding vineyards. It’s known world-wide for its Brunello red wine. Our first day will include a morning workshop on composition, exposure, and camera settings to capture the best light. This will prepare you to get the most out of your time photographing in the field. Other workshops will include long exposure and working with filters, technical and creative elements of photography, and post-processing using Lightroom. We will also provide opportunities for image reviews and feedback. Our week includes photographing at the best times of the day including a some sunrises and sunsets. Some days we’ll be up and out before dawn to capture the landscape as the sun rises over the misty hills. Other days, we’ll photograph late into the evening to create images that glow with the light at sunset. Locations will be decided based on weather conditions. Although our days will be full, we will provide opportunities for rest and relaxation. 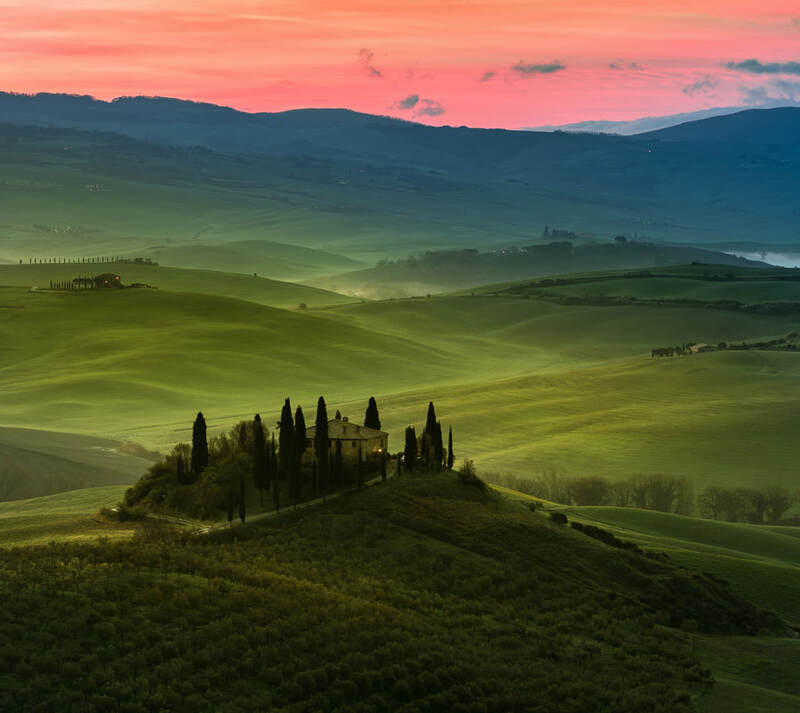 Our goal is to take you to amazing places to photograph in Tuscany and help you take your photography to the next level. We hope you’ll join us to explore, create, and be inspired. Small group size to provide for personal attention and one-on-one instruction. Accommodation in Val d'Orcia with private, ensuite bedrooms. All meals from dinner the first night until breakfast the day of departure. 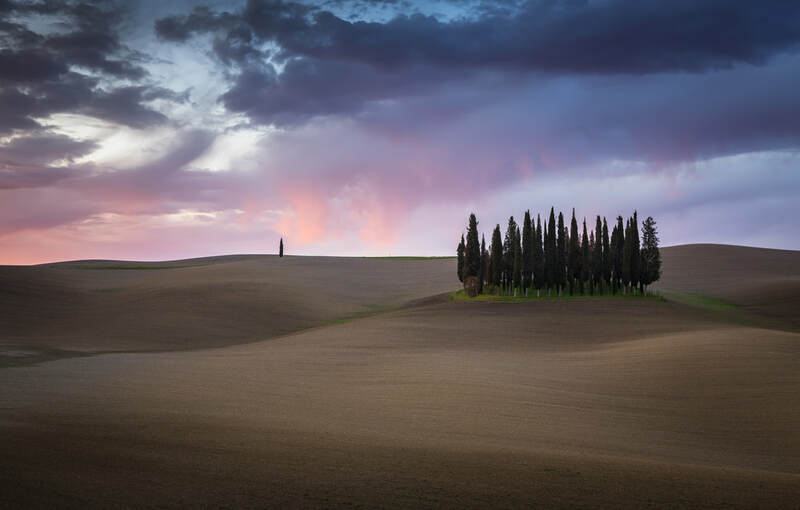 Workshops on composition, long exposure landscape photography, post-processing and image reviews. Courtesy transportation from FCO, Rome airport at 2:00 pm, Sunday, April 7. Courtesy return transportation to FCO, Rome airport departing at 7:30 am, Sunday, April 14. Guests can also provide their own transportation to San Quirco by car, train, and taxi from Florence, Rome, and Pisa, or other areas in Italy. ​NOTE: Airfare is not included. Courtesy airport transfer FCO, Rome 2:00 pm April 7. NOTE: Airfare is not included. ​Please contact us with your questions and we’ll be happy to help you.